I am often asked by other journalists, entrepreneurs, and investors why I cover the French tech market. In an effort to avoid the disappointingly obvious “it’s because I live here” answer, I have always said that it is because France is a country of people with a higher than average level of education and a higher than average access to internet and mobile. 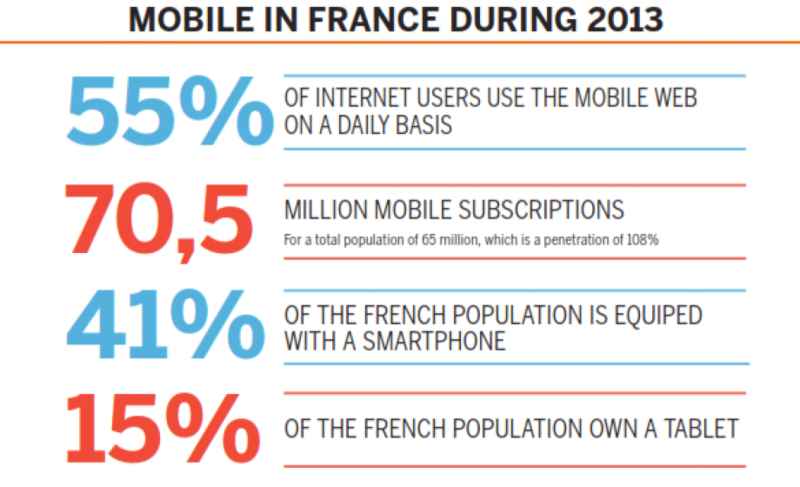 A recent study produced by Outbrain on Mobile Marketing, the Israeli-turned New York startup took at the history of Mobile in France, which revealed some quite interesting results. Among other results, the study found that there are more mobile subscription (70.5 Million) plans than citizens (65 Million), meaning that Mobile penetration has surpassed 100%. 41% of those subscriptions are smartphones, 58% of which are Android (as opposed to 25% iOS). This is poor. 70m subscriptions vs. 65m citizens does not make 108% market penetration – with 65m citizens the market penetration of mobile is determined by how many of those 65m have at least one mobile. If 10% have two, that does NOT give you 20% market penetration. Outbrain is that service slowing down my browsing experience and feeding me junk sites with celeb gossip and leaving me with tracking cookies. Awesome; re the previous comment about market penetration.